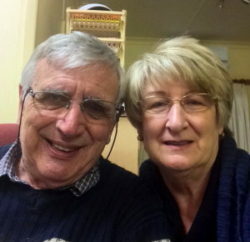 The Bering Drive church has partnered for well over 30 years with Chester and Angela Woodhall in southern Africa. After relocating from their native home in Great Britain to Zambia, the Woodhall family shared with thousands the Good News of God’s creation, redemption, and freedom through Jesus Christ, of whom many had previously never heard. Hundreds of churches and groups were formed, most thriving to this day. Chester and Angela then worked in Boputhatswana, a “homeland” which became re-incorporated into South Africa following the end of apartheid. In recent years they have worked on the Eastern Cape of South Africa. Through teaching in colleges and churches, forming new groups of Jesus-followers, and extensive work in prisons and communities, they help bring hope to countless people, facilitating racial reconciliation and spiritual growth which God provides. Both have served in political offices, reflecting the light of Christ in service and influence. For some 40 years, the Bering Drive church has helped support Ruperto Davila, working on both sides of the Mexican border. In addition to planting and nurturing local churches, he has instituted and led schools in which students become trained and qualified to bring the Gospel to various locations and lead church groups there. For many years, he has led the school in Monclova, Mexico, from which students have graduated each year. The past few years, Brother Davila has also planted and led a church on the U.S. side of the border, in San Benito, Texas. Trips to visit them are encouraged; the visitor will find encouragement in the service being offered there, and it will be a good opportunity to practice your Spanish! Fausto Salvoni, a native Italian, served many years as a Biblical and theological scholar as well as a leader in the Churches of Christ in Italy. A number of his works were translated into English, expanding their influence. His widow, Enrica Salvoni, continues to work with the local church and provides an inspiration to those on both sides of the Atlantic of faithful service. The Bering Drive church is honored to continue to provide some support to this Godly and faithful widow. Update: Enrica Salvoni passed away on May 19. Please keep the Salvoni family in your prayers during this difficult time. We are honored to have partnered with the Salvoni family for so many years.